What is a Diastema and How do I Treat It? A diastema is an area of extra space between two or more teeth. The two front teeth of the upper jaw area is where diastema is most frequently seen. Many children experience diastema as primary teeth fall out, though in most cases these spaces close when the permanent teeth erupt. Orthodontic treatment to move the teeth and close the diastema. Use porcelain veneers, very thin pieces of porcelain bonded to the outside of the teeth. Crown and bridge work or replacement of teeth with implants (adults only). If you have an oversized labial frenum, you may be referred to a periodontist for an oral consultation and surgical procedure called a frenectomy. This procedure involves cutting the frenum and then repositioning to allow for more flexibility. If the frenectomy is conducted on a child, the space may close by itself. If it is a teenager or adult, the space may need to be closed with braces. A consultation with your dentist is essential to determine which option is the right option to treatment for you. If you're having diastemas and looking for a treatment option, please contact our Lakewood dentist today! Injured Tooth - What Should I Do? 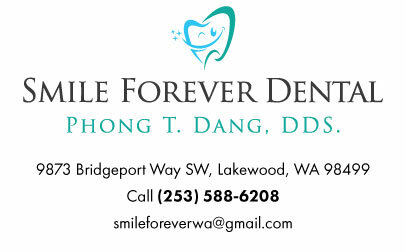 Smile Forever Dental in Lakewood. All rights reserved.